A group of senior former World Bank employees has urged beleaguered head Paul Wolfowitz to resign, saying he can no longer be an effective leader. Mr Wolfowitz is battling to remain in his job after admitting helping his partner win a promotion and pay rise. More than 40 World Bank officials, including 18 former vice-presidents, published their call in an open letter to the Financial Times newspaper. They said Mr Wolfowitz had "lost the trust and respect of bank staff". Mr Wolfowitz, who has apologised for his "mistake", has vowed to stay on to continue what he called "important work". He has said that he is confident he can carry out the World Bank's mission. But the authors of the letter said, "There is only one way for Wolfowitz to further the mission of the bank: he should resign." "He has [...] damaged his own credibility on good governance - his flagship issue," the letter reads. The letter was signed by, among others, the former number two in the organisation during the first year of Mr Wolfowitz's time at the Bank, Shengman Zhang. The former senior officials warn that if Mr Wolfowitz remains in office, he will "preside over a rudderless hulk". The letter comes as the group responsible for overseeing the workings of the World Bank, the Independent Evaluation Group (IEG), warned that the current crisis was already having a negative impact on the work of the lending agency in developing countries. The IEG statement will be presented to the Bank's board, which is expected to reach a decision on the fate of Mr Wolfowitz later this week. The row concerns events that occurred shortly after Mr Wolfowitz assumed his position at the World Bank. His girlfriend, Libyan-born Shaha Riza, was seconded from the World Bank to the US state department to avoid creating a conflict of interest. There she received promotions and pay rises which the bank's staff association say were "grossly out of line" with bank rules. The bank's executive board has said that it did not give its approval for Ms Riza's wage rise. 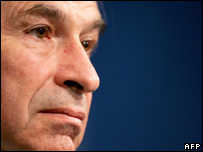 Mr Wolfowitz was seen as a controversial nominee to the role from the beginning due to his part in driving forward the war in Iraq.